Commercial strength copper based systemic bactericide and Fungicide. This new formula leave no residue on leaves even at the highest rates. Very broad spectrum disease control. Safe on Blooms. We spray this product late spring and early fall as a tool for disease preventation program. Use as directed on labels. 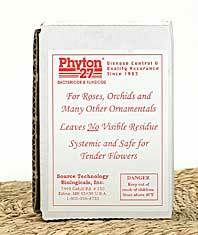 With its broad and expanding label , Phyton-27 is your partner in controlling bacterial and fungal disease in your orchid collection.